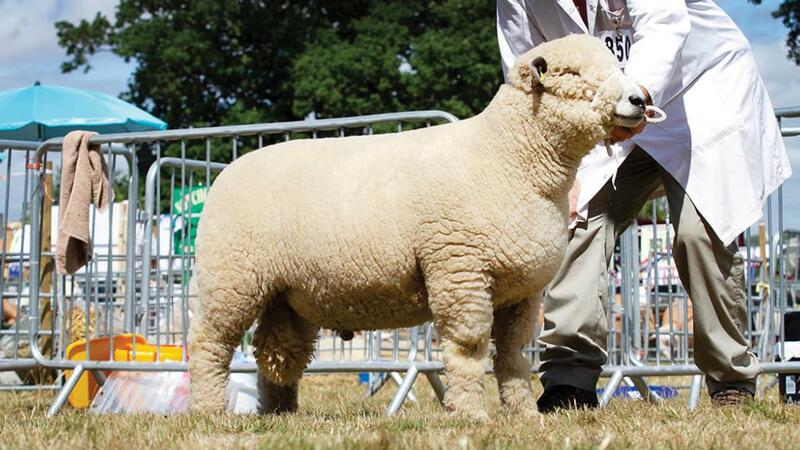 Claiming Burwarton’s inter-breed sheep title was a home-bred Kerry Hill shearling ewe from John and Philippa Owens and family’s Woodhouse flock, Leominster. Inter-breed sheep and Kerry Hill champion from the Owens family’s Woodhouse flock, Leominster. 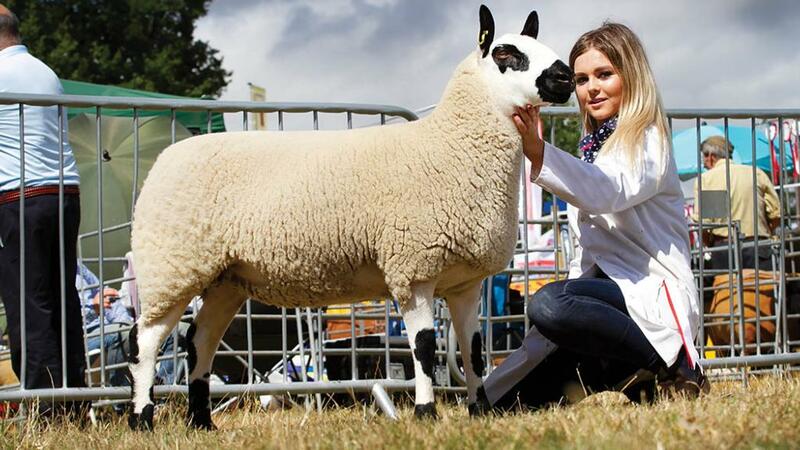 By a Penrenant ram, it took the breed championship at the Royal Welsh and was reserve breed champion at Kington Show last year. Reserve was a Ryeland shearling tup, Widgits Xemplar, from Steve Gray and Doreen Smillie Gray, Herefordshire. Bought as a lamb, it was reserve male champion at Devon County and Royal Bath and West this year and breed champion at Monmouth Show. Inter-breed beef and Salers champion, Seawell Invader, from Fred Robinson, Stretton. Inter-breed sheep reserve and Ryeland champion, Widgits Xemplar, from S. Gray and D. Smillie Gray. 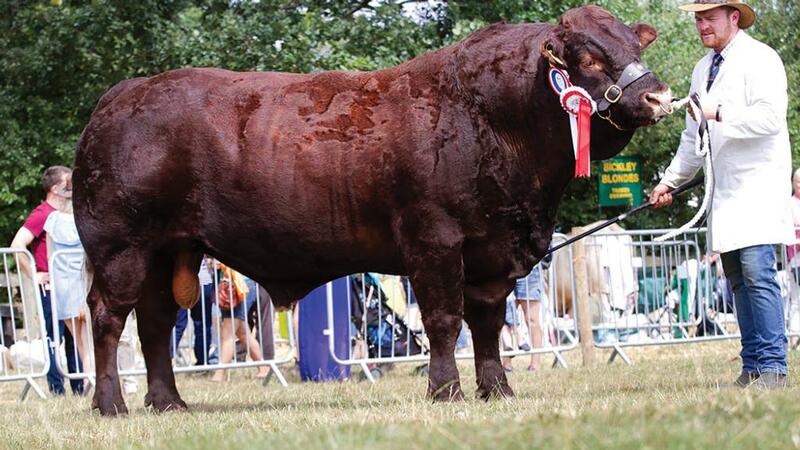 In the beef cattle lines, inter-breed judge Robert Neill, Jedburgh, chose Church Stretton-based Fred Robinson’s 2013-born Salers bull, Seawell Invader, by the imported sire Denver, as champion. 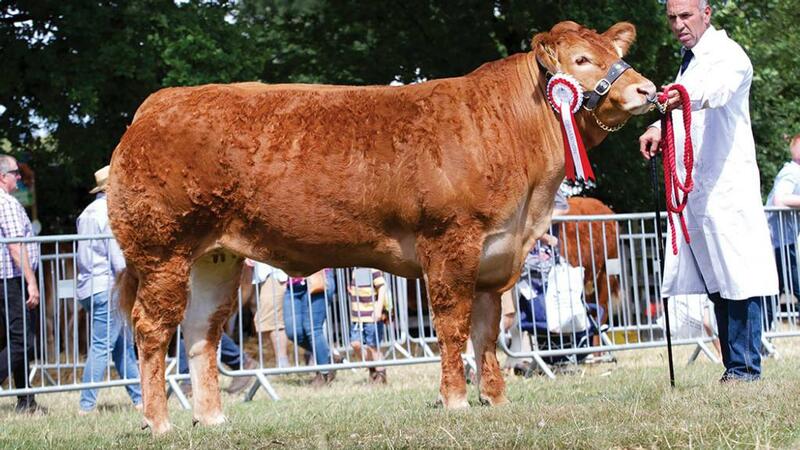 Taking the reserve was a Limousin heifer from Paul Dawes, Dinmore, Herefordshire. Dinmore Naturelle is a January 2017-born heifer by 145,000gns Trueman Jagger out of Dinmore Elle. Taking the native inter-breed title was a Highland heifer, Urshula 1 of Yarchester, from M.J. and V.M. Monk. Leominster-based Burnett and Lloyd partnership took the commercial championship with a Limousin cross steer, Dark Shot. Taking the top spot in the small selection of dairy cattle was the Holstein champion, January 2015-born Hawksmoor Dot 91 by Farnear-TBR Altaavalon, out of the EX92 Hawksmoor Dot 71, from Rob Clare, Market Drayton. Inter-breed (Judge, R. Neill, Jedburgh) Supreme, J.F. Robinson and Sons, Seawell Invader (Salers); reserve, P.R. Dawes, Dinmore Naturelle (Limousin). Hereford (D. Wyllie, Tamworth) Sup., D.E., E.D and A.L. Jones, Gouldingpoll 1 Moonshine; res., B. Birch, Sky High 1 Rock-The-Boat. Limousin (L. Hughes, Anglesey) Sup., P.R. Dawes, Dinmore Naturelle; res., P.R. Dawes, Dinmore Madonna. British Blonde (P. Holman, Okehampton) Sup., N. Rogers, Hill Head Mario; res., G. Needham, Whitty Millie. British Blue (P. Halhead, Lancaster) Sup., P.R. Dawes, Dinmore Lioness. Longhorn (S. Gurton, Wormingford) Sup., J. Brewer, Pointer Dynami Eagle; res., B. Facon, Gentons Qasim. Highland (D. Handley, Dorstone) Sup., M.J. and V.M. Monk, Urshula Dubh of Chadwick. Beef Shorthorn (T. Russell, Stanford on the Vale) Sup., P.R. Daqwes, Dinmore Zoe Katrina; res., R. Heard and G. Twoers, Greenley Rosette Likely. Dexter (K. Hasemore, Chichester) Sup., Tooloos Dexters, Tooloos Beech; res., Tooloos Dexters, Tooloos Friesia. Any other pure bred native (T. Russell) Sup., P. Pennington, Oldinton Boomerang (British White); res., E. Astbury, Marshbrook Dragonfly (British White). Any other pure bred continental (D. Batch, Romsey) Sup., J.F. Robinson, Seawell Invader (Salers); res., J.F. Robinson, Preenbank Misty (Salers). Commercial (C. Pennie, Montgomery) Sup., Burnett and Lloyd, Dark Shot (British Blue cross); res., N. Porter, Sooty (Limousin cross). Inter-breed beef reserve and Limousin champion, Dinmore Naturelle, from Paul Dawes, Herefordshire. Inter-breed (R. Pilkington, Wrexham) Sup., R.J. Clare, Hawksmoor Dot 91 (Holstein); res., Messrs Tudor. Holstein (R. Pilkington) Sup., R.J. Clare, Hawksmoor Dot 91; res., Messrs Tudor. Any other breed and commercial (R. Pilkington) Sup., N. Madeley, Nejay Erin II (Dairy Shorthorn); res., D. Dawes, Parkplace Topeka Tina (Jersey). Inter-breed (J. Long, Worcester) Sup., J. and P. Owens (Kerry Hill); res., S. Gray and D. Smillie-Gray (Ryeland). Texel (J. Davies, Llandeilo) Sup., P. and C. Tippetts; res., R. Davies. Beltex (J. Owens, Llandysul) Sup. and res., P. and C. Tippetts. Suffolk (D. Farr, Llanon) Sup. and res., P.M. Fletcher. Charollais (D. Roberts, Shrewsbury) Sup., O. James; res., B. James. Lleyn (C. Price, Brecon) Sup., J. Hamer; res., P. and C. Andrews. Berrichon (T. Pritchard, Worcester) Sup., M.R. Williams; res., O. James. Shropshire (M. Hackling, Shrawley) Sup., J. Hares; res., E. Russell. Blue Texel (S. Gibbons, Brecon) Sup. and res., P. and C. Tippetts. Zwartbles (J. Kimber, Okehampton) Sup., S. Bower; res., D. Grinnall. Clun Forest (B. Francis, Newcastle on Clun) Sup., I.T. Davies and Son; res., C. and N. Meredith. Jacob (L. Trumper, Abergavenny) Sup., R. Edwards; res., B. Barker. Coloured Ryelands (C. Jones, Anglesey) Sup., B. Summerfield; res., R. Whitticase. Ryeland (P. Wilksinson, Everingham) Sup., S. Gray and D. Smillie-Gray; res., J.R. Morgan. Badger Face Welsh Mountain (D.M. Evans, Carmarthen) Sup., L. Levinge; res., N. Dillon. Non-accredited pure-bred (B. Rodenhurst, Farlow) Sup., R. Yates. Any pure breed (T. Ward, Churchstoke) Sup., D. Grinnall (Border Leicester); res., L. Crowther and M. Gray (Dorset Horn).